Though fly fishing is often presented as a complicated endeavor, it is simply the traditional method of delivering a lightweight fishing lure using the weight of a fly line, rather than the lure or weight at the end of the line. These lures are called flies, traditionally made with feathers and other natural materials, but can also be created with synthetic materials for different applications. Once you learn a few basics, the fundamental fly fishing principles can be applied to destinations and species around the world, though you could spend a lifetime trying to master the water within an hour of your home. The cast is the most elementary skill of fly fishing. For small-water anglers who want to pursue trout and bass species, accurately casting 20 feet will be enough to get you started. There is no substitution for personal instruction as you’re learning. Everyone who fishes has a slightly different cast, so a trained instructor can help teach and tune your cast to set you on a path of quick improvement. Classes and instruction, like those offered at the Painted Trout, will make the learning curve more manageable. YouTube and video tutorials are a decent substitute, but are no match for personal instruction. Since you don’t need anything on the end of your line, you can practice in your yard or in a park without worry of hooking anything. At this point, you might still be confused on the setup of a fly rod and how to cast using the weight of the line. Since most flies are relatively weightless, a fly angler uses the cast to “load” momentum into the springy rod and then fling the heavy fly line, which carries the fly with it. Because fly line is thick and heavy when compared to conventional fishing line, we attach a leader to the end of the fly line. Leaders are made of monofilament nylon, and look more like a conventional fishing line. Typically between 7 ½ feet and 9 feet long, and tapering thinner near the fly, leaders serve a number of purposes. First, the length of this nearly invisible nylon keeps the fly far beyond the end of the fly line which, if set onto the water near the fish, would spook them. The taper itself also provides a smooth transition between the two weights, or masses, of the fly line and the very thin monofilament that actually is tied to the fly. This enables your cast to present the fly in a more delicate and natural manner. You will also hear about “tippet,” which beginners often confuse with leaders. Tippet material is the same monofilament, but instead of being a fixed length and tapered from fat to thin, tippet is one continuous diameter and you cut it to your desired length. Tippet is attached to the end of the leader via one of the knots you will learn, and finally, your fly is tied on to the end of your tippet. If this starts to drive you nuts, go to your local fly shop and ask them for help. If they’re worth the socks they’re standing in, they will help you with pleasure. You might also ask them to show you the knots you need, though YouTube is also a great source for these. A fly rod is more expensive than a normal fishing rod, but is actually more versatile in most cases. Most fly shops will have a variety of rods in different price ranges, so you can find a good rod setup for your budget. 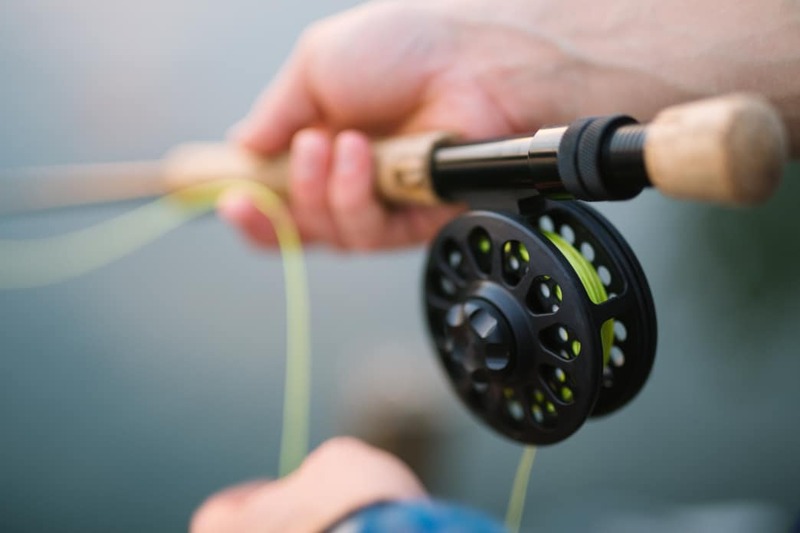 Fly rods are classified by weights, so get a 4 or 5 weight if you plan on fishing for trout and panfish, or consider a 6 or 8 weight if you’re more interested in smallmouth or other larger species. To get the most bang for your buck, a good quality floating (not sink tip or sinking) fly line will transform an economically priced fly rod. You also don’t need waders right off the bat. Plenty of people walk around streams and lake banks in sandals or old tennis shoes when it’s warm. If you have a boat or a dock, you can learn to fish there. You can use a canoe, but don’t stand up in it unless it’s specifically made for that. Once you’ve achieved a good workable cast (easier said than done) and acquired a rod, reel, some flies, forceps for removing hooks, and nippers to clip the monofilament that you tie to your flies, you’re ready to get fishing. To locate your spot, find a mentor who is willing to take you out, or talk to the staff at your local fly shop. Local insight can provide intel on beginner-friendly streams and rivers. One tactic is to find a local fishing club and attend meetings or events. Clubs love beginners, and good clubs go out of their way to mentor them in both casting instruction and fishing information. Don’t be put off if you can’t find a club or a mentor right away. Like most things, you only get good fishing if you practice, so just get out there. You’ll gain confidence in the current and soon you’ll be wading downstream and upstream and everywhere in between. It doesn’t matter if you don’t catch fish every time. Remember, it’s called fishing, not catching. A surefire way to develop your skills is to find a small stream with bass and bluegill. 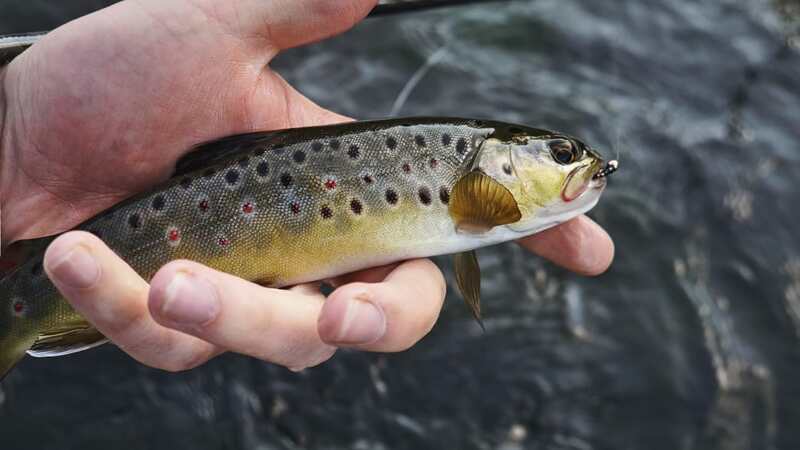 These fish can be caught with techniques that are used for trout, but are easier to catch than trout and can help hone your technique. While trout are generally harder to catch, Michigan’s native brook trout are very aggressive, and will attack dry flies (flies that sit on top of the water) for much of the year. Plus, they tend to live in really beautiful places, so you can’t go wrong even if they aren’t biting. The Painted Trout or your own local fly shop can recommend species-specific or seasonal flies, but there are a few versatile flies that are always nice to have on hand. As you grow in the sport, and we hope you do, you’ll find you’ve amassed quite a number of flies before you know it. Wooly Bugger : A wooly bugger is extremely versatile. Imitating a baitfish, leech, worm, or a crayfish, a black or olive wooly bugger is an indispensable “streamer.” Just cast it into a fishy spot and “strip” it back with 3-12 inch pulls, or cast upstream at a 45-degree angle and let it drift naturally through a run. San Juan Worm : Everyone knows that fish like worms, so we imitate them quite often in fly fishing. Flies like a San Juan are cheap and easy to fish, but you want to add a tiny split shot to your leader and fish it under an indicator (a fly fishing bobber). Fishing a worm pattern is one way to practice nymphing, which imitates bugs below the surface where fish do most of their feeding. Remember, worms and tiny bugs don’t really swim, so you want to drift the flies as naturally as possible. This is one of those techniques which will be easy for you to master once you understand the basics. Poppers : For lakes and streams that have smallmouth bass (extremely prevalent in Michigan), fly fishing with a popper is arguably the most fun thing you can do on water. Poppers make a disturbance on the surface of the water and elicit aggressive strikes. Simply cast them around logs or other structure, make one “pop” by yanking the fly line, and wait for a few seconds before popping again. These are just five things. We could have made this post “10 Things…” but we don’t want to overwhelm you. If you live in Southeast Michigan, give us a call to see if there is a class on the schedule, or to book a private lesson. Either way, just get out there!